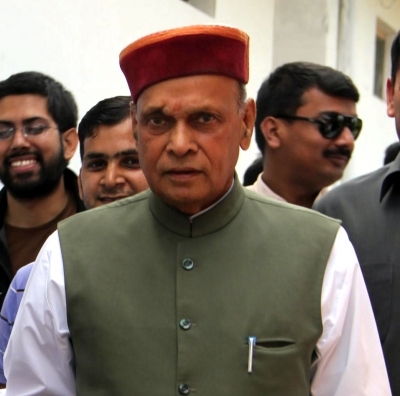 New Delhi, Oct 31 (IANS) The BJP on Tuesday appeared to have been forced to announce Prem Kumar Dhumal as its chief ministerial candidate in Himachal Pradesh after reports that the Rajput voters, who can tilt the scales in the assembly elections, could be inclined towards Congress, which has already nominated rival Rajput and incument Virbhadra Singh as its CM face. The decision to name Dhumal, which was announced by BJP chief Amit Shah at an election rally in the state, was taken after hour-long deliberations involving state as well central leaders including party General Secretary (Organisation) Ram Lal, state in-charge Mangal Pandey and state BJP chief Satpal Singh Satti. Shah is on a five-day visit to the state and holding rallies for the party. Sources in BJP said that going into the elections without a CM face sent a message among voters and party cadres that the central leadership may nominate Union Health Minister J.P. Nadda, a Brahmin, as its Chief Minister after the polls if the party gets majority in the state Assembly. The Brahmins in the state are around 18 per cent. According to sources, Shah took feedback of each constituency from the leaders and found that the dominant Rajput community, which is around 38 per cent of the total population, were inclining towards the Congress. Even before the list of candidates was made public, Dhumal, on his part, was assertive by projecting himself as the rightful contender to the post more than Nadda, who appeared to have the blessings of the BJP leadership. It also emerged in the deliberations that Congress was getting an advantage with Singh as its CM face while non-declaration of a CM face by the BJP may hurt its chances. Sources said that an internal survey done by the party also suggested the lines of opinions expressed by party leaders in the meeting. Due to non-declaration of a CM face the party was divided in two camps — one led by Dhumal and the other by Nadda. Elections to the 68-member Himachal Pradesh Assembly will be held on November 9 and the votes counted on December 18 along with Gujarat. The BJP central leadership had earlier wanted to contest the assembly elections without declaring a chief ministerial face and to take a call after the poll results depending upon the situation. The sources said the leadership wanted to shift Nadda to the state after the polls if the BJP registers a resounding victory. The decision to name Dhumal as its chief ministerial face is believed to be a setback for Nadda, who was also in the race for the post. The BJP had earlier toyed with the idea of projecting him as a possible Chief Minister face. As part of this strategy Nadda was made a union minister in the Modi cabinet and his profile was built up. Dhumal, 73, a two-time Chief Minister was keen on fighting the polls after being declared the CM face but the party has not warmed up to the idea earlier. He is contesting the elections from Sujanpur constituency after being shifted from his traditional Hamirpur seat. In the 2012 elections to the 68-member assembly, which saw a voter turnout of 73.92 per cent, the Congress won 36 seats, the BJP 26 and Independents six. But in 2014 Lok Sabha elections, the BJP had won all the state’s four seats with a vote percentage of 53.85 per cent, while the Congress got 41.07 per cent votes.